The keyboard with amphitheatre style and curve key design provides super cool mechanical feeling. The smooth 3D roller with anti-skid scale grain on the mouse ensures you to operate comfortably. The buttons structure adopt precursor type streamline design provides excellent click sense. Quickly control each function, ergonomic design, comfortable to operate. 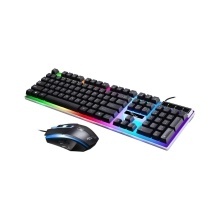 Rainbow color backlight effects bring cool gaming experience, in particular increasing gaming keys backlit effect and easy type in the dark. This is a mechanical feel gaming keyboard, not the real mechanical keyboard, but tones clear, feels good, user experience is similar to mechanical keyboard.